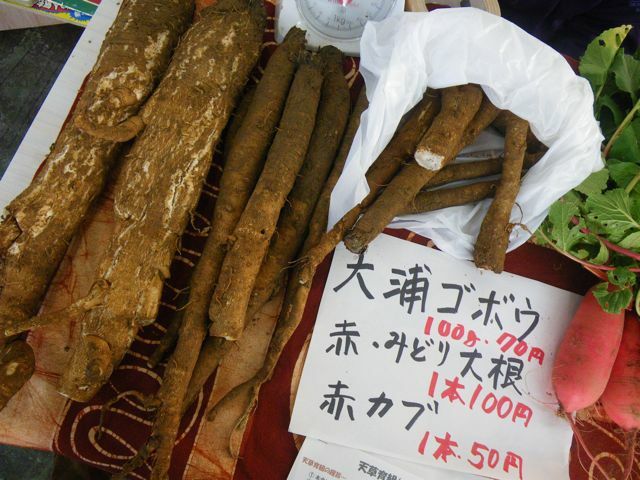 Burdock root, greater burdock or edible burdock root is called “gobou/牛蒡” in Japanese. Its Latin name is Arctium lappa. 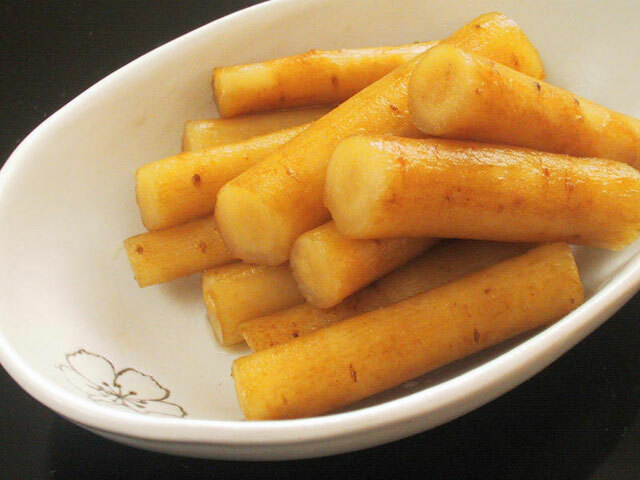 Although it is a root vegetable with great nutritious and even medical properties, it is commonly eaten only in Japan and Taiwan. This species is native to the temperate regions of the old world, from Scandinavia to the Mediterranean, and from the British Isles through Russia, and the Middle East to China and Japan, including India. It is naturalized almost everywhere and is usually found in disturbed areas, especially in soil rich in nitrogen. 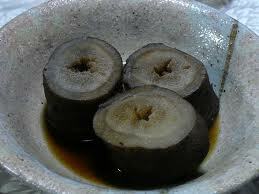 It is commonly cultivated in Japan. It prefers a fresh, worked soil, rich in humus, and should be positioned in full sunlight. Burdock is very reactive to nitrogen fertilizer. Propagation is achieved through sowing the seeds midsummer. The harvest occurs three to four months after the seeding until late autumn, when the roots become too fibrous. In shizuoka it is more and more cultivated in organic fashion with natural/organic fertilizer and no pesticides. Greater burdock was used during the Middle Ages as a vegetable, but now it is rarely used, with the exception of Japan where it is called gobō (牛蒡 or ゴボウ), Taiwan (牛蒡), Korea where it is called ueong (우엉), Italy, Brazil and Portugal, where it is known as bardana. Plants are cultivated for their slender roots, which can grow about 1 meter long and 2 cm across. Immature flower stalks may also be harvested in late spring, before flowers appear. 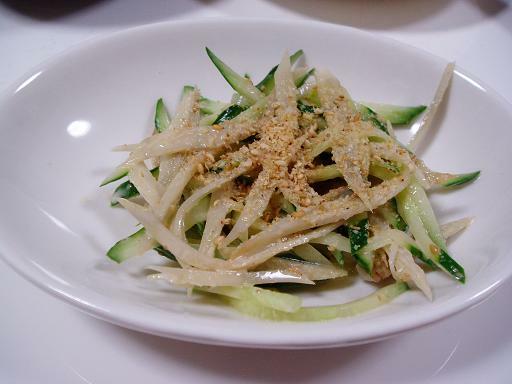 The taste resembles that of artichoke, to which the burdock is related. 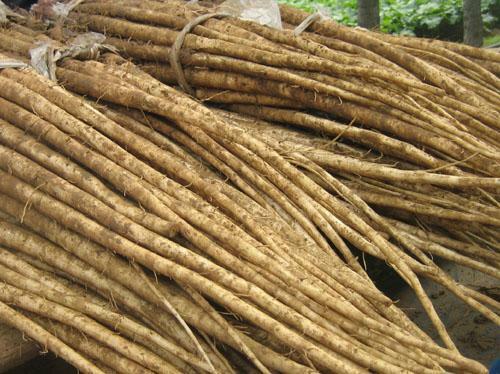 The root is very crisp and has a sweet, mild, and pungent flavor with a little muddy harshness that can be reduced by soaking julienned/shredded roots in water for five to ten minutes. The harshness shows excellent harmonization with pork in miso soup (tonjiru) and takikomi gohan (a Japanese-style pilaf). 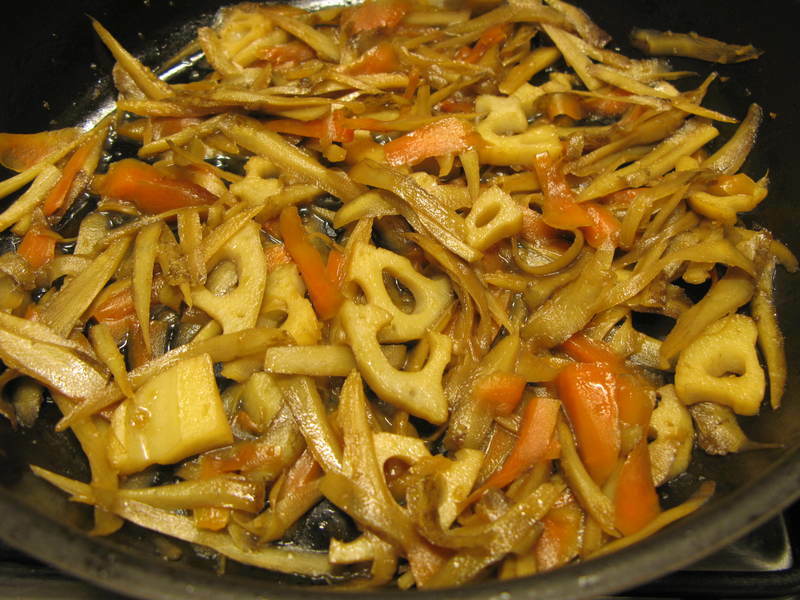 A popular Japanese dish is kinpira gobō, julienned or shredded burdock root and carrot, braised with soy sauce, sugar, mirin and/or sake, and sesame oil. 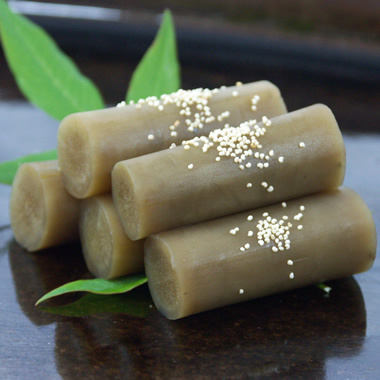 Another is burdock makizushi (rolled sushi filled with pickled burdock root; the burdock root is often artificially colored orange to resemble a carrot). In Kyoto, gobō can also be found as a snack food similar to potato chips. The root is eaten cooked and the young sprout can be eaten just like asparagus. 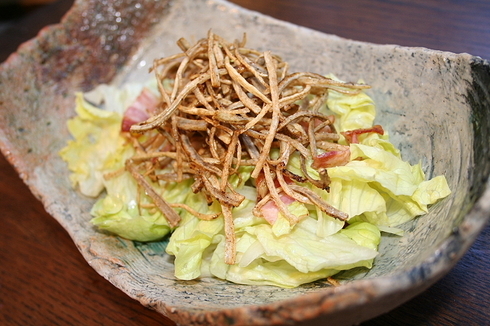 Gobo is also used in tempura. Apart of its obvious culinary value, it is also valuable for its high content in dietary fibers and beneficiary nutrients. It has been utilized as a medicinal plant with diuretic, diaphoretic, and blood purifying capabilities. 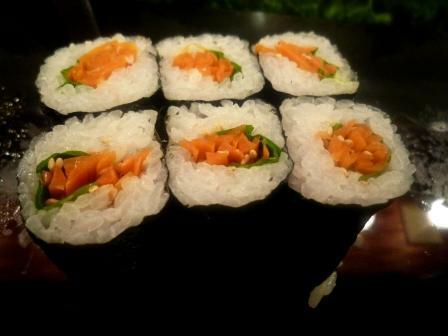 The Japanese have also recognized it to prevent cancer and combat diabetes. -Combined with seaweed (wakame), or celery, or enoki mushroom, or konnyaku, helps prevent high blood pressure and blood vessels hardening, helps with hair health and recovery from constipation. -Combined with dried daikon, or shiitake mushrooms, or celery, or turnips, helps prevent cancer, helps fotiify stomach, and increases skin qulaity. 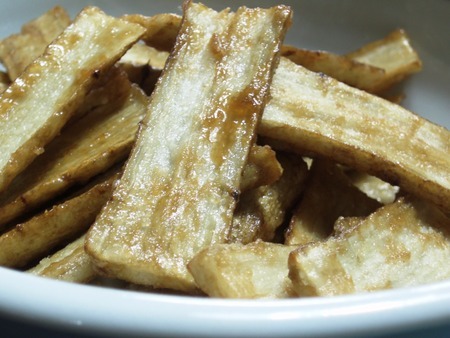 -Combined with hijiki sweet seaweed, or tofu, or bamboo shoots, or agar agar, helps reduce blood cholesterol and general diets. -Combined with whole rice (genmai), or oatmeal, or corn flakes, helps prevent diabetes, helps combat obesity and helps prevent blood vessels hardening. 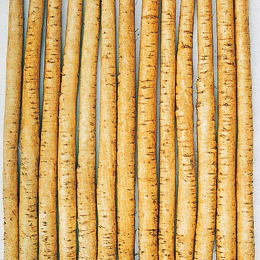 Oura Gobou/大浦ごぼう (on the left), a very thick variety, which reaches 10cm in diameter for 1 meter in length. Yama Gobou/山ｇｐぼう, a thinner and shorter variety. 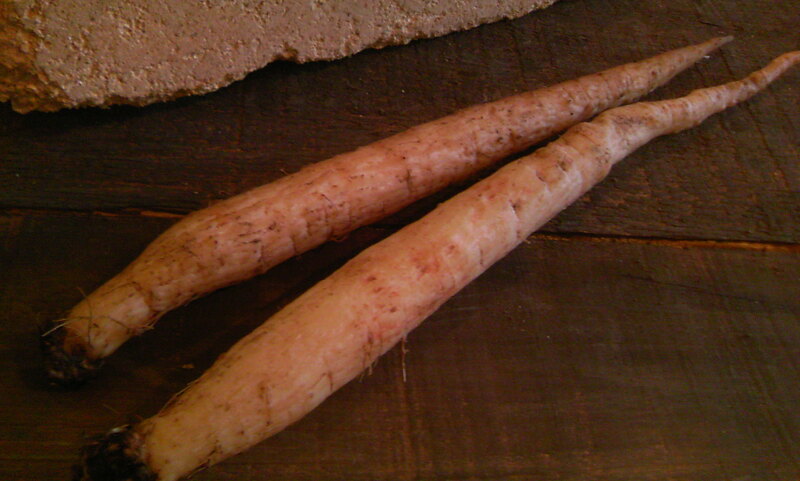 Super Risou Gobou/スーパー理想ごぼう, a75 cm long and thin variety with a smooth skin. Do not peel before cooking as the skins contain a lot of nutrients. 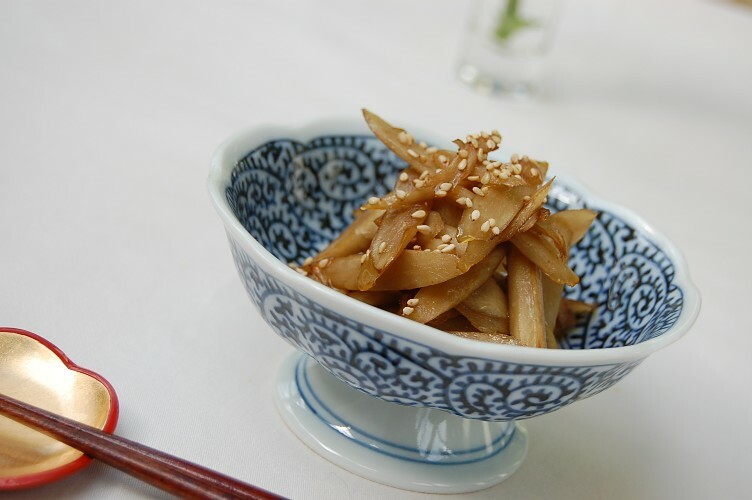 “Kinpira” burdock, thinly cut and fried with sake, soy sauce, mirin and chili sesame oil. What are your reference sources on the health benefits you listed above on burdock? Thanks! These health benefits are officially recognized by the Japanese government! Simple as that! Please do feel free to use any pics or information! Thay are for sharing! In Shizuoka many burdock are more or less grown organically, that is almost in the wild. In Shizuoka, the largest variety called o-ura is grown organically at the foot of Mount Fuji. The more organic the strongre and more delicious taste! Thanks Robert, that’s interesting to know. I’ll tell you when the article gets published, and make sure to link to your post here. Great infor and pics on the burdock. We have been eating this for a long time usually to make soup. More of the same coming!